An education and reward program run by the Maine Lakes Society that assists lakefront homeowners manage landscapes in ways that protect water quality. The program is free, non-regulatory and voluntary. ﻿Workshops ﻿available ﻿for ﻿invasive ﻿plant ﻿patrol ﻿and ﻿can ﻿be ﻿found ﻿on ﻿the ﻿website. “Headway speed” means the minimum speed necessary to maintain steerage and control of the watercraft while the watercraft is moving….The operator must consider the effect of the wash or wave created by their watercraft to waterfront piers, floats or other property or shorelines. There are growing concerns about the use of fireworks around lakes. As fun and enjoyable as fireworks can be, they may be causing more damage than you know. This is an update from research done over the past decade, unrelated to the latest concerns over water clarity at Basin Pond (see newsletter). As early as 2005, Daniel Frost (Geology), then a senior at Bates College, studied Paleoclimate Reconstruction Using Physical Sedimentology and Organic Matter Biogeochemistry of Varved Sediments, Basin Pond, Fayette, ME. Frosts’s co-advisor was Mike Retelle. In 2013, Professor Retelle and a team of researchers studied the sediments in Basin Pond and other similar ponds in the area. Bates is located just south of “the lakes region” in south-central Maine. Researchers have undertaken numerous projects in courses and in thesis research on many lakes ranging from coastal “isolation basin” lakes that were formerly depressed below sea level to density stratified lakes that contain laminated sediments that archive high resolution sediment records. One of the study sites in central Maine is Basin Pond, a 30 meter deep “meromictic” lake*. The water column in this lake is permanently stratified and has a detailed sediment record of environmental change with annual resolution preserved in the finely layered deposits, similar to tree rings. * A meromictic lake has layers of water that do not intermix. In ordinary, "holomictic" lakes, at least once each year, there is a physical mixing of the surface and the deep waters. The term "meromictic" was coined by the Austrian Ingo Findenegg in 1935, apparently based on the older word "holomictic". See updates on the research here and here. See another paper based on the research at Basin Pond. 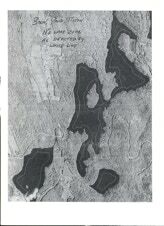 And another paper, showing that Basin Pond is of great interest.